Statuspage.io is an incident reporting service that can be used to display the status of your servers, as well as send incident reports via SMS or email to subscribers of your status page. NodePing can send event information to StatusPage.io via our webhook functionality so StatusPage can display when there is an outage. 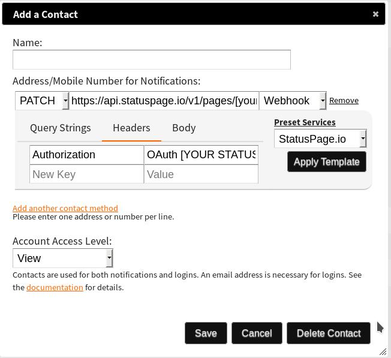 You can create a contact with our webhook template and associate it with your desired Nodeping checks and StatusPage component. Like all of the types of notifications supported by Nodeping, StatusPage notifications consist of two components: An "address" setting in Contacts, and a notification setting that applies that contact information to your checks. 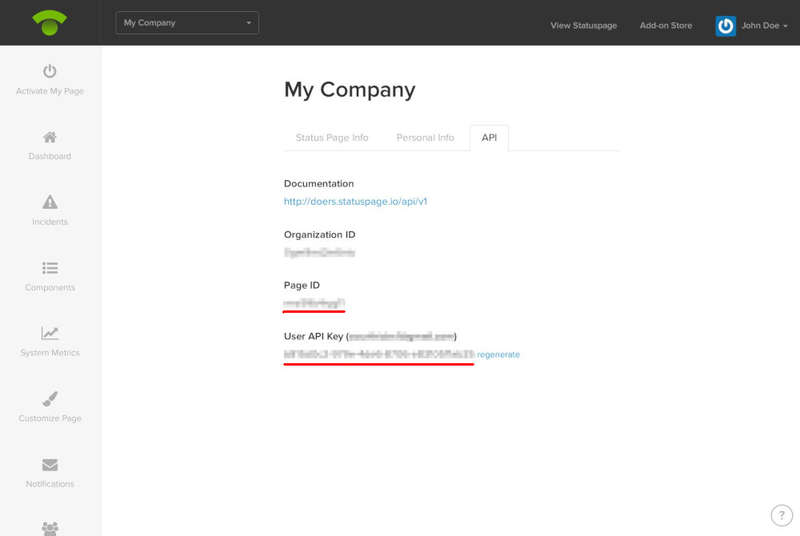 To get the StatusPage.io API key and Page ID, first go to your account settings by clicking Manage Account in the dropdown menu at StatusPage.io. Then go to the API tab to get the API key and Page ID. Finally, you will need to get the StatusPage.io Component ID for your chosen component. To do this, go to the Components tab, find the Component you want to use and click the edit button. On the next page, you will see the Component ID in the URL in your browser. With those three pieces of information, visit the Contacts section in NodePing and chen click the Add new contact button. Enter the name for the contact. 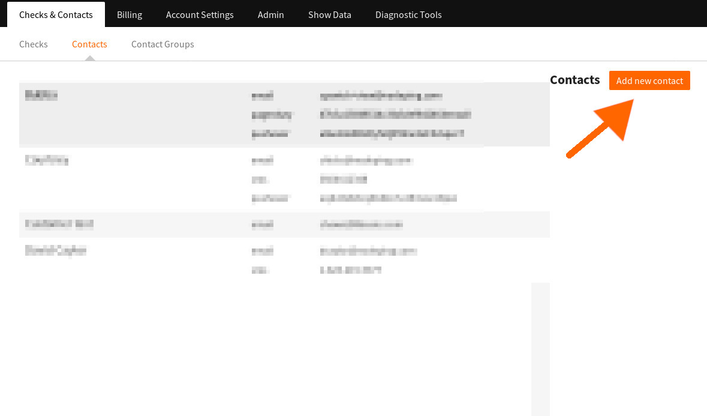 Click the contact type dropdown and select Webhook. In the Preset Services dropdown menu, select the StatusPage.io template and click 'Apply Template'. In the address bar fill in the appropriate PageID field and ComponentID parts with the information you got from StatusPage.io. Select the Headers tab and replace "[YOUR STATUSPAGE API TOKEN]" with your API token from StatusPage.io. With the data entered properly, you can now assign your newly created contact to the checks you want associated with StatusPage.io and you can begin to use your NodePing checks with StatusPage.